I won't let you be anything but holy, good, and free. The word spoke through the ages for all people...just like you and me." The Word of God has brought each of us here tonight. For whatever reason, in whatever way, you are here to welcome the Christ child once again. To experience the word of God that is with us. With those who need light. That is the grace and mystery of this evening. That you are here to celebrate a baby born in a manger. For whatever reason, in whatever way, you are here to remember that Christ is born for you. Even on days when you feel alone or abandoned by God. Even on those days when only lament comes to your lips. Perhaps with pressure from parents, or in memory of the candles and silent night. Yes, the Word of God is with us and stirring in our souls. There is a mystery tonight. That the word of God came to us in the form of a baby. With sheep and cattle too. The word of God came to us in the simplest and purest of ways - the innocence of a baby. and the compassion to feed a hungry world. The Word of God embedded in Mary's womb, the woman who knew that God would do mighty things for the lowly. The Word of God known by John the Baptist who leapt in his mother's womb. And the audacity of a mother who said yes to the impossible. The word of God grew up to be a man, The word of God, Jesus. The word of God spoke through the ages for all people....just like you and me. I won't let you be anything but holy, good and free." The word of God has the fearlessness of David who overturned the bullies of his day. The word of God has the quiet spirit of Mary to sit at the feet of the hurting. The word of God has the energetic fervor of Martha to make sure all are fed and cared for. The word of God has the peace of the nameless woman to wash the feet of a hurting world. The word of God has the hope of a hemorrhaging woman to reach out hands to stop pain and suffering. The word of God has the persistence of the widow to never settle for anything less than wholeness. The word of God spoke through the ages for all people...just like you and me. The word of God comes to you and me. The word of God comes in the form of broken pieces of stained glass to form a cross of hope. The word of God comes in the form of an outstretched hand offering support. The word of God comes in a meal for a new mother and a grieving family. The word of God comes in the joy of a child rushing to peer into the manger. The word of God comes in the welcome and love to all finding their identity. The Word of God comes to give us a new name greater than anything we call ourselves, that of Child of God. the Word of God declared that nothing would be out of the reach of love and grace. The Word of God is with us. And even if we try, as we have in the past, God can never be kept out. For the government tried to stop the Word. On a cross, where death came and all power emptied. The Word could not even be contained by death. The Word, Jesus, cannot be kept out. The word of God does not need an invitation or a welcome. For even when the inn keepers and the world said, "We have no room." The word of God came anyway, in a manger in a barn, to show us love that has no bounds. So much heartache and so much violence these last few days. So much to sigh over. In the midst of violence and loss and suffering, words often fail. I've been waiting to write a blog post reflecting on the events from the last few days until after Sunday morning. I needed to wait. For on Sunday morning at church we were looking forward to the Christmas pageant. It's been planned for months. The costumes were ready. The stage set. The children excited. The story of Jesus waiting to be told. You see, I waited to reflect until I witnessed hope through the eyes and ears and voices of children. As a congregation, and as a community, we needed to see life. We needed to see hope embodied. We needed to smile through the tears. We smiled as children came one by one to be a part of the pageant. We smiled as everyone had a part to play. We smiled when the angels were up and down and lifting their skirts for all to see. Angel wings and joy up and down the aisles. We smiled at the Darth Vader voice of one of our narrators. We smiled when Joseph entered played by one of our younger girls. We smiled when baby Jesus wasn't in the spot Mary had hoped and it seemed for a minute that baby Jesus was lost. We smiled when the cast of characters told the congregation that God came for each of us. During worship, as a congregation and as a world grieving, we came together because we need each other. We need to pray for one another. We need to hear the prayers of others. We need to speak words of justice and compassion. We need to speak truth to power. We need to use our hands and feet to reach out to our neighbors and strangers. We need to see hope embodied through the story of a baby born in a manger, a story of Jesus born to die on a cross to overcome death once and for all. A story of light overcoming the darkness. We witnessed a story enacted through the simple acts and voices of children. In the clumsiness of a people searching for the light. In the quiet voices of angels. In bread and wine. In silence and stillness. In babies crying. The ordinary acts of each of us together spoke extraordinary volumes of love. Olivia runs up to me with her arms wide as she wraps her hands around my waist and exclaims, "I just wanted to tell you that I really like you! I wanted to tell you earlier but you were busy." And yes I was busy earlier. She was referring to when I was leading worship on Sunday morning. So, just a little busy, I suppose. This encounter happened after worship on the second Sunday in Advent. As a community we're counting down till Christmas. We are waiting. We are looking into the darkness expecting the light to come. And we are tired. At least I am. I am tired and thinking I'm much busier than I should be after all my talk of rest and Sabbath during this season. At least it seems as if I'm running in all directions as I'm visiting, writing, reading, preparing, proofing, sermonating, baking, calling, organizing, cleaning, and remembering to breathe. Then in the midst of worrying what I forgot to announce in worship and whether I'll remember the prayer request just given to me, Olivia comes running to me with her arms wide open. "I just wanted to tell you that I really like you. I wanted to tell you earlier but you were busy." Perhaps that is how God feels when loving each of us? Perhaps God's arms are always poised with welcome and love and we're just too busy to notice? What of all those other times that I was too busy to notice God's love stretching to embrace me? Because isn't that just like God to sneak up on you with the innocence and pure joy of a five-year-old? Isn't that just like God to come to us no matter how busy or stressed or inopportune the time? Isn't that just like God to remind us that true worship isn't about us but about the One who loves us unconditionally? Thank God for five-year-olds and for unrelenting love. And thank you, Olivia, for reminding me that any time is a time to be reminded of love. "Someone has to watch baby Jesus." 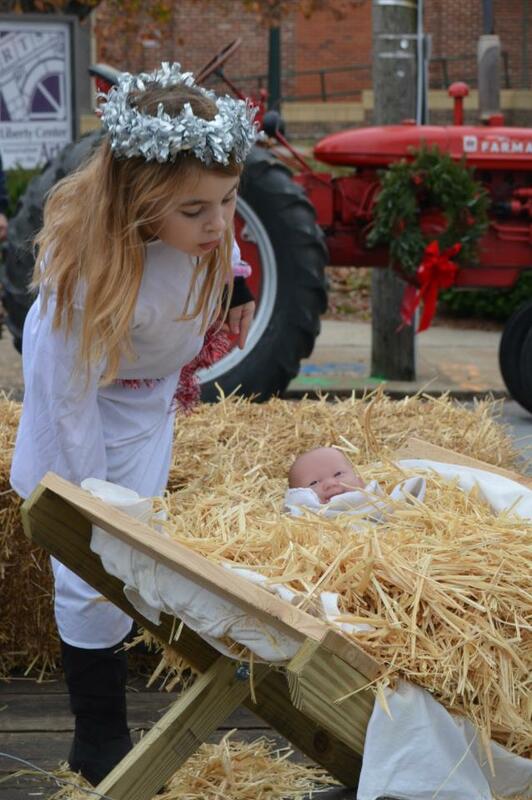 The words spoken from one of our younger theologians at church as our baby Jesus doll lie in the manger and straw. We were gathered for the church's second time in the Sedalia Christmas Parade. A kick-off to the Christmas season on an unusually warm and clear day. Surrounded by sleighs, trees, decorations and lights, we were dressed in jeans and t-shirts more likely preparing for spring than the winter to come. "Old Fashioned Christmas" was the parade theme. The church had an old fashioned truck with an old fashioned Christmas scene complete with fireplace, popcorn-strung tree, and a grandmother lovingly reading to her grandson. She read to him the original story. The greatest story some may say. For us, it was the original story - that Nativity story of Christ's birth and the light entering the world. There on the other side of the float sat the children dressed as angels, shepherds, Mary and Joseph. And there in the manger lie the baby Jesus, a favorite doll picked just for this occasion. As with any parade there is much waiting. Waiting for the parade to start. Waiting to start moving once the parade begins. Waiting when the floats get in a traffic jam. Waiting for the candy to be passed out to the children lining the sides of the street. As we sat and waited dressed in costumes, one of our angels said, "Someone has to watch baby Jesus." Perhaps she was afraid of baby Jesus getting picked up in the wind. Or concerned for this favorite doll of her friend. Or like an adoring angel, she wanted to make sure Jesus received his due appreciation and honor. Truth is, her words hit me as I've been more concerned about Jesus watching me. I worry about whether Jesus is really with me in my pain and longing. I question his hopefulness for a weary world. I'm more concerned that Jesus is with me than about watching for Jesus in our midst. I'd rather complain that Jesus has left me to wander the darkness alone than seeing him in the light of others. Thanks to the words of an angel for the reminders of Jesus in our midst. For Jesus was there as we gathered and laughed and planned. 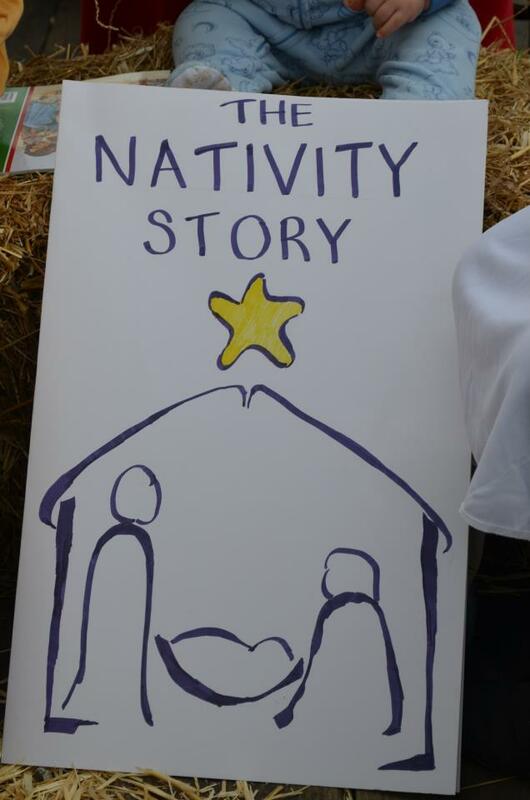 Jesus was there in the excitement of children dressed to tell the greatest story. Yes, we all have to watch baby Jesus. Because, you see, Jesus is on the move in the world. Everywhere. In the beginning and in the end. And everything in between, Jesus is with us. Watch out world, because with Jesus in our midst angel voices can be heard proclaiming good news that will bring great joy to all people.